This was a great week so let's get right to a dose of accountability! It feels GREAT to have a week above 20 miles again! I think I'm ready for Goofy Challenge training to ramp up! 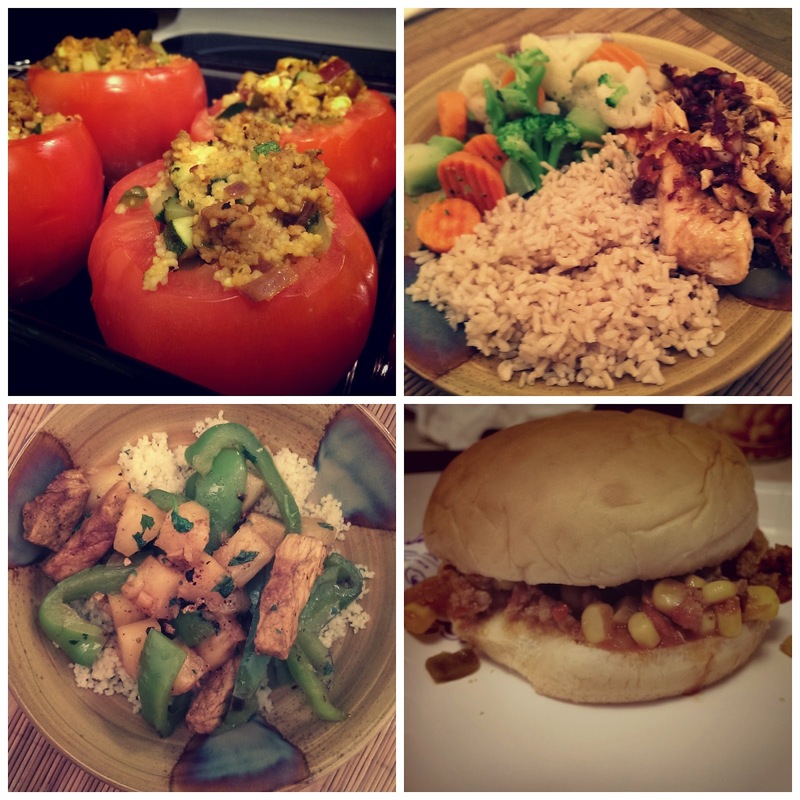 Stuffed Tomatoes, Balsamic Glazed Salmon, Curry Pork and Pineapple, Southwest Sloppy Joes. Yum. Because we had a race on Saturday, I tried to properly fuel and hydrate on Friday. 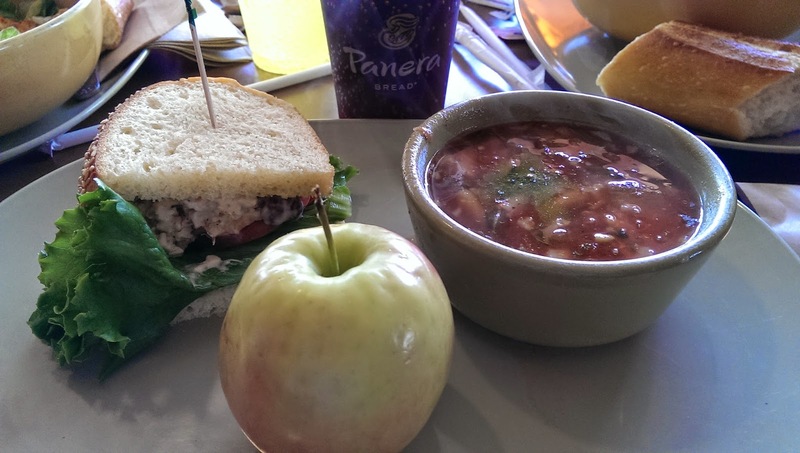 Enter Panera's Napa Almond Chicken Salad Sandwich and Garden Vegetable with Pesto Soup. I'd never had the chicken salad before and absolutely loved it. It might be my new favorite! 157.8 pounds as of 7/30/14 weigh-in. -44.2 since heaviest: 202 in 2005. All smiles after reaching a weight-loss milestone. QOTD: How do you reward yourself when you reach a goal? Way to go Sarah! Reaching a goal that you've been after for awhile always results in feeling on top of the world! It totally does! Thanks, Kathryn! Great job! You look amazing!!! CONGRATULATIONS, Sarah! That is so awesome! You are looking great! I'm proud of you for not getting discouraged over the slight gains here and there. It's easy to just throw it all away when that happens, but you didn't, and look how great you are doing! I know that you are going to reach your goal! Thanks, Lisa! Weight loss can be SO frustrating! All my life, I've given up- but not this time. Honestly, writing these accountability posts is helping tremendously. I can't hide anymore- I have to keep moving forward no matter how well or poorly I did that week. You look fantastic, but even better, you are feeling it! Congrats on reaching that milestone! I usually reward myself with something new (specifically for working out/running) – clothes, shoes, etc. I love Panera's Napa Almond Chicken Salad Sandwich - - so so good! Thanks, Heather! I am really glad I bought myself the skirt- so much better than a food reward! Woohoo! Congrats! 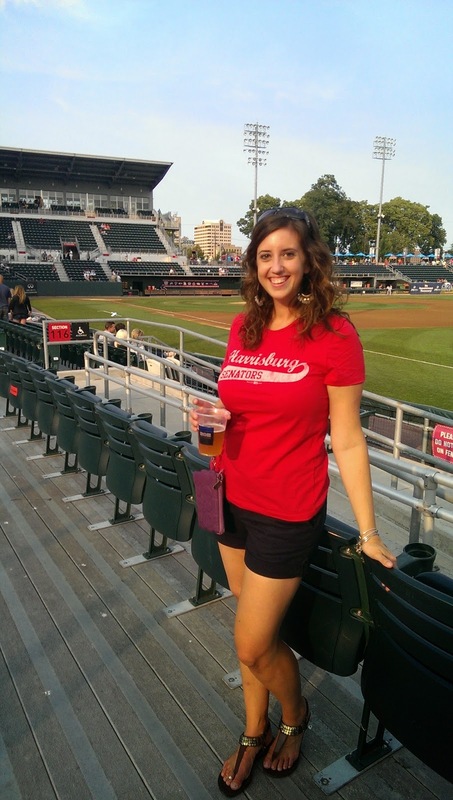 You are totally rocking those shorts and look awesome! Enjoy your new run skirt. You deserve it! I am so proud of you! You look fantastic! I usually reward myself with new gear if I hit my goals. It makes them that much better!